Apple dropped support for Google’s mapping database in late 2012 and released its in-house Maps app with iOS 6. While the new application added extravagant three-dimensional imagery and a smoother interface, the software was riddled with bugs, unreliable data, and lacked many of the critical mobile mapping features found in the Google Maps app. Scott Forstall, the long time confidant of the late Apple co-founder Steve Jobs, was in charge of the Apple mapping effort and was ousted for declining to apologize for the product’s shortcomings. Soon after Forstall, iOS engineering executive Richard Williamson was pushed out of Apple for his involvement in the app’s development. Looking forward, Cue, Federighi, and Gautier have been leading teams of Apple engineers since Forstall’s departure in order to make amends to the Maps app’s data and interface so it is more reliable. Last year with iOS 7, Apple re-architected the app’s interface to fit the bright, translucent style of Jony Ive’s take on mobile operating system design. But while the interface for Maps was redesigned last year, Apple’s focus for 2014 is under-the-hood changes. Thanks to extensive engineering work and acquisitions of several companies such BroadMap, Embark, and HopStop, Apple’s database for iOS Maps will be upgraded with enhanced data so it is more reliable, according to sources. The new application will also be injected with new points of interests and new labels to make places such as airports, parks, train stations, bus stops, highways, and freeways easier to find, the sources added. Sources also say that the mapping application’s cartography design has been tweaked to be slightly cleaner and to make streets more visible. In addition to the mapping data changes, Apple will add one of the most important mobile features to Maps this year: public transit directions. Late last year, sources said that Apple had been planning to release transit support in iOS 8, and now the same sources are indicating that the plan is on track to be executed. Using data acquired via acquisitions and various partnerships, transit will be deeply integrated into the new maps application. Transit directions allow a person to use an iPhone to travel from one destination to another via public transportation. iOS 8 Maps will be able to tap into train, subway, and bus data and provide enhanced directions to major airports. The functionality will exist in major cities, such as San Francisco, Los Angeles, and New York, and will expand to other locations across the United States and potentially other countries across the world around the public launch of iOS 8. Transit directions will be embedded into Maps as both an option in the classic Directions panel and as a new mapping view. In the Directions view, transit will be an option alongside Driving and Walking. In the viewing options menu, a way to clearly view train stations, airports, and bus stops will be an option alongside the Standard, Hybrid, and Satellite views. 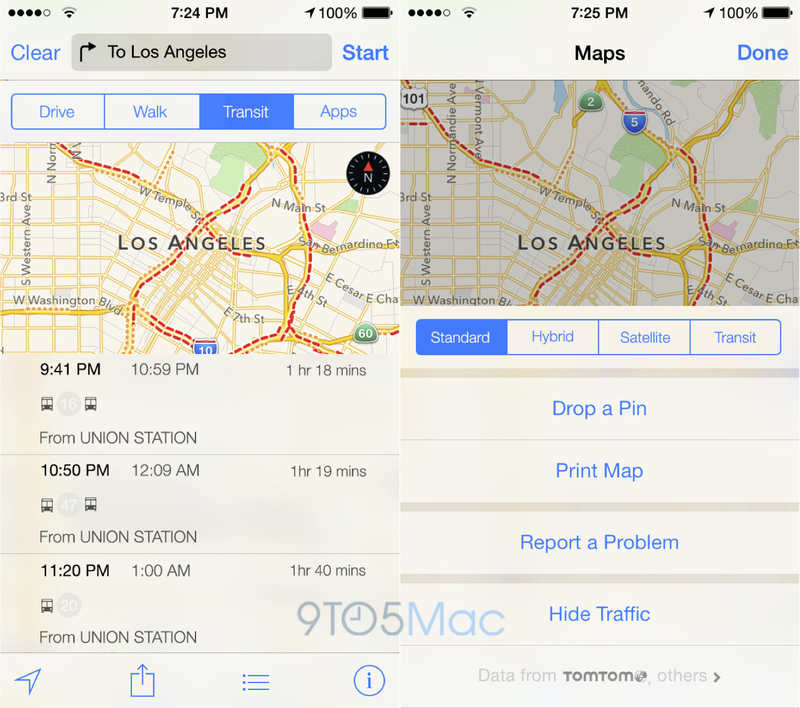 While Apple will now have its own transit functionality, the Maps application will still be able to point users to App Store apps for additional transit-infused software. Users will be able to choose to receive transit directions to depart immediately or input a date and time for their travel and receive directions for use at that later time, according to the sources. Apple will also allow users to set transit directions as the default method of transportation (as opposed to walking or driving) so that frequent users of public transit can more quickly find directions to their destinations. That option is said to be in the iOS Settings menu. Users will also be able to use the standard iOS sharing functionality to email their route or share it via social networks. Apple’s plans to improve mapping data and add transit functionality are just the pipeline for 2014. 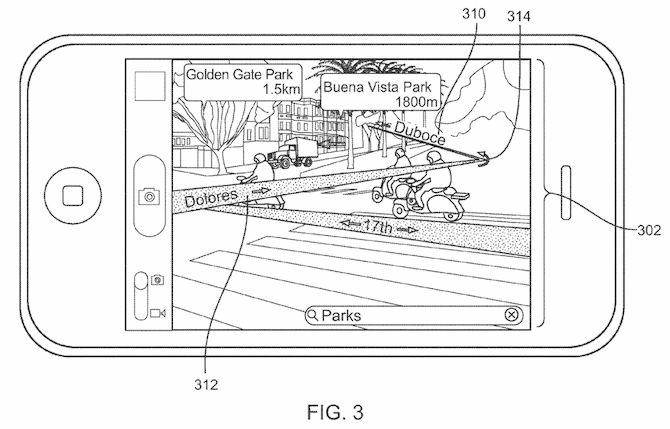 Apple is also working on unique ways for integrating indoor mapping views and enhanced car integration for future versions of iOS. Sources say that Apple has also begun work on augmented reality functionality that leverages the iPhone’s compass hardware to visually see nearby points of interest. This feature is likely to surface in the coming years. Apple received a patent for such functionality in 2011. Apple is likely also working on an updated version of its Maps app for OS X that adds the improved data. In addition to the new mapping software, iOS 8 is planned to include an application called Healthbook to manage user fitness activity and health information.